The trick of treating this Halloween is definitely Jelly Belly jelly beans. These delicious, colourful, beautiful and versatile beans can spook up the simplest recipes. Makes 12 fairy cake sized cakes. Scale up to 3 eggs for a dozen larger cakes. Add the eggs, butter, flour, sugar, cocoa & salt to a bowl and beat with a hand whisk until blended. Add the milk and briefly mix again. The batter should be loose enough to dollop off a spoon. Line a bun tin with fairy cake cases. Fill each case 2/3 with batter and bake at 190C / GM 5 for about 12 minutes until risen and when a cocktail stick inserted into the cake comes out clean. The secret to fluffy buttercream is to beat the butter really well before you add any sugar. Beat the butter until it is soft and fluffy, and then slowly add the icing sugar, cocoa, vanilla and milk. You can make butter cream in advance and store in the fridge until needed (remove from the fridge well before you need it) I store mine in the piping bag, with a clip just behind the nozzle and the end of the bag twisted so it is airtight. 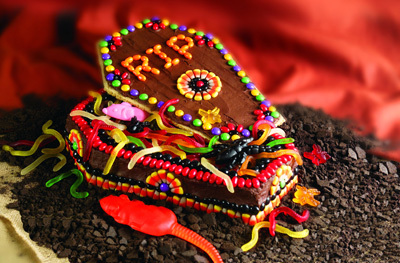 Decorate your cakes with the Halloween flavours of Jelly Belly of choice. 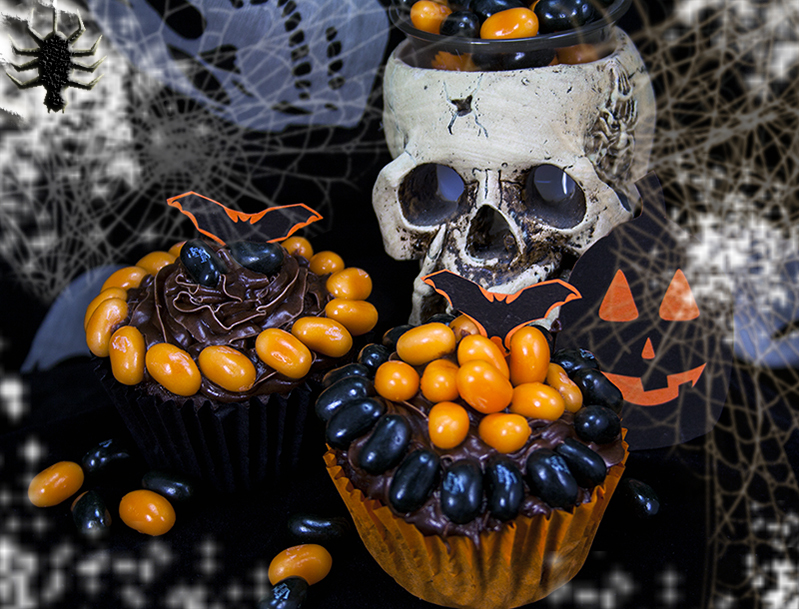 The oranges, blacks, purples and bloodcurdling red are the obvious ones but Halloween is about doing things YOUR way! Talk about a cake to die for. This macabre masterpiece will be the talk of any Halloween blowout. 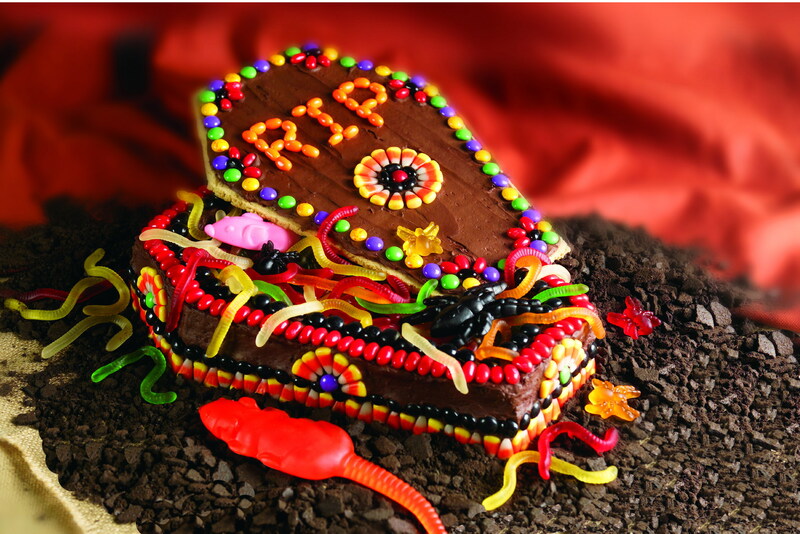 Covered in chocolate and filled with surprises, this is one coffin that people will be anxious to dig into. 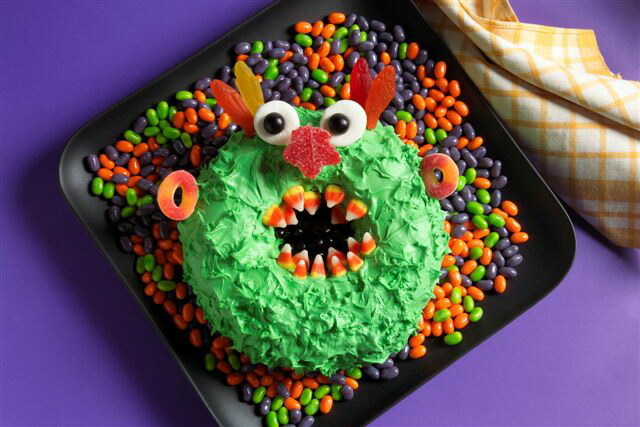 This monstrously delectable dish will be the hit of your Halloween party. It’s easy to make and uses simple ingredients; the only thing scary about it is how good it tastes! There are over 100 true-to-life Jelly Belly jelly bean flavours. With their intensely juicy taste, made from the finest ingredients available, every single bean can take up to 21 days to create. Each Jelly Belly jelly bean contains just 4 calories and is free from fat, wheat, nuts, gluten, dairy and gelatine. They are certified OU Kosher and are suitable for vegetarians. Jelly Belly jelly beans are available in all good sweet shops and also Sainsbury, Waitrose, selected Tesco and Morrisons and most department stores. 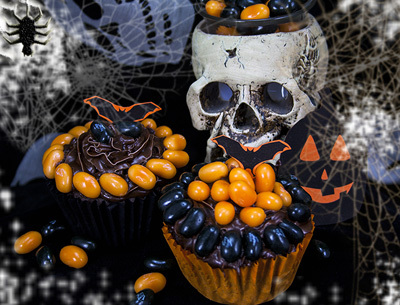 CREEPY CUPCAKES: Cooking up a JELLY BELLY Halloween horror!